Superdry women's Sleek Piste ski jacket. Keep warm while taking on the mountain. 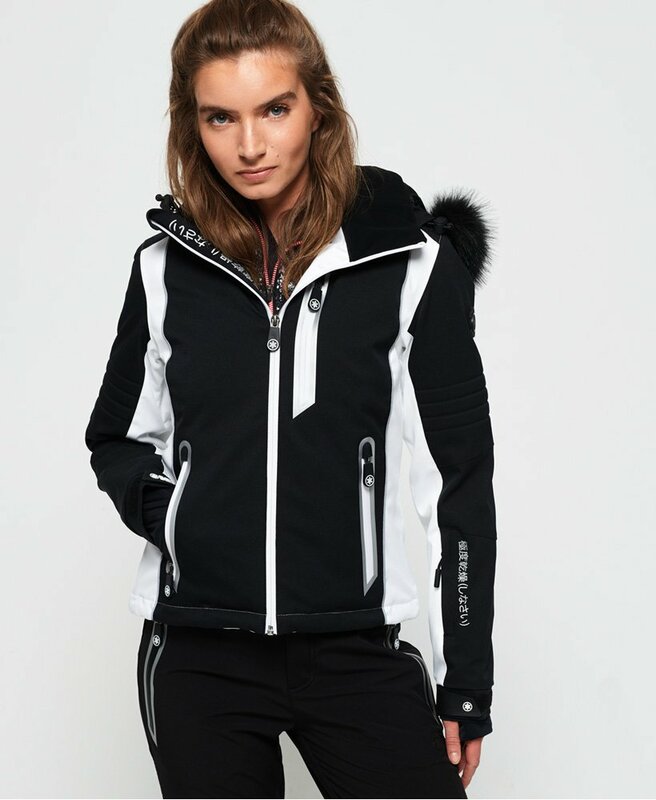 This stylish ski jacket features a removable hood and faux fur trim, making this an incredibly versatile jacket to wear all season round. On the inside, the jacket has a media pocket, an incredibly soft lining and a snow skirt, keeping the snow out and you warm. This jacket has been designed with your comfort in mind, with pit zip venting, hook and loop cuffs and elasticated hem and hood, so you can make this jacket the perfect fit for you. Outside, the jacket has three large front zip pockets and a pocket on the arm specifically for your lift pass, helping you get through that lift queue with ease. The Sleek Piste ski jacket is completed with a variety of Superdry's iconic Japanese inspired graphics and a logo badge on the sleeve.